‘The Church lives according to concepts, thoughts and experiences that are very far from many of our contemporaries. And it is quite complex for people to cross the frontier that separates this world from the world of the Church. To take this step people need guides which they lack. We do not have enough bridges between the world of the Church and secular society’. 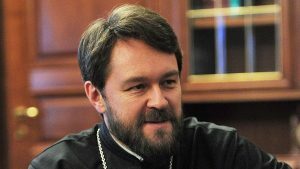 On 30 March 2011 the Head of the Church’s Department of External Relations (DER), Metropolitan Hilarion of Volokolamsk, met students from the Theological Faculty of St Tikhon’s Orthodox University of the Humanities. The meeting took place in the University auditorium and was also attended by the Head of the Synodal Department for Charity Work and Social Service, Bishop Panteleimon of Smolensk and Vyazma, the Chancellor of St Tikhon’s University, Archpriest Vladimir Vorobiev, as well as University tutors. The Chancellor of St Tikhon’s greeted Metropolitan Hilarion. In reply, the Head of the DER congratulated Archpriest Vladimir Vorobiev on his 70th birthday and presented him with a pectoral cross and expressed his best wishes for Divine aid in his future work. Speaking to the audience, Metropolitan Hilarion touched on the issue of reforms to theological education. These reforms have been ongoing in the Russian Church for almost 20 years. Eighteen months ago His Holiness Kyrill, Patriarch of Moscow and all the Russias, made a new push for their completion and clarified the direction of their development. ‘At the last meeting of the Holy Synod framework documents were approved. These are not definitive and will be perfected as they are put into practice. 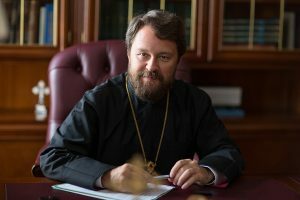 Reforms to theological education will be implemented in accordance with them’, noted Metropolitan Hilarion. Metropolitan Hilarion called St Tikhon’s a new type of educational institution that corresponds to the standards set by Russian and, to a considerable extent, Western academic theology. According to the testimony of the Head of the DER, ‘one of the aims of the reforms to theologian education in the Russian Church is to bring it into conformity to the standards of secular academic studies in Russia and also of Western academic theology’. The Archpastor emphasized that St Tikhon’s is ahead in the reforms to theological education and has set an example for other educational institutions. In particular, the experience of St Tikhon’s was used when the Church set up its St Kyrill and Methodius Postgraduate and Doctoral Courses, under the Chancellorship of Metropolitan Hilarion of Volokolamsk. Today there is close collaboration between the two educational institutions: the Master’s programme and a strategy for future development are being worked on. Metropolitan Hilarion expressed the hope that collaboration between the Church’s Postgraduate Courses and St Tikhon’s University will develop further, that there will be exchanges of experience and tutors and that graduates of the University will apply for the Postgraduate Courses. 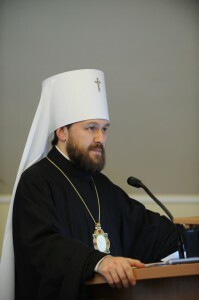 In Metropolitan Hilarion’s words, modern society lacks witness to the values of the Gospel because there are psychological and even linguistic barriers between the Church and society. ‘The Church lives according to concepts, thoughts and experiences that are very far from many of our contemporaries. And it is quite complex for people to cross the frontier that separates this world from the world of the Church. To take this step people need guides which they lack. We do not have enough bridges between the world of the Church and secular society’. “You may become those bridges, those guides, you who study in an Orthodox University, but are acquiring a wide range of knowledge in various fields’, continued Metropolitan Hilarion, talking to his student audience. ‘One of the missionary challenges of the Church is the education of those who will be able, living in society and working in secular jobs, to carry out the great and vital missionary task bequeathed to us by the Lord Himself’. In his talk, Metropolitan Hilarion reminded the students that the study of foreign languages is one of the priorities of theological education. ‘Today the world is more and more joined up, the frontiers between civilizations, nations and members of different linguistic groups are disappearing. To be able to speak the language of another people and understand members of other faiths and confessions is an important challenge for the contemporary Christian’. Following up this idea, the Archpastor noted: ‘Today we cannot close ourselves off in our context, in our Orthodox subculture, to which we are accustomed and find it difficult to leave. Today’s world lives according to rules other than those of the Church. The challenge for the contemporary Christian is, without betraying the Faith, without indulging ourselves, without any compromises, to be able to speak to people in a language which is easily understood and accessible to them and to be able to transmit our experience of the Church so that they can really take it in. Apart from knowledge, self-motivation and a missionary spirit are required for this’. The Head of the DER expressed the wish that all the students should always have such a missionary spirit, reminding them that real Christians must carry out an apostolic service, regardless of whether they are ordained or not, regardless of gender, age or any other factors. After his talk Metropolitan Hilarion answered many questions from the audience. At the end of the meeting, the Chancellor of St Tikhon’s Orthodox University of the Humanities, Archpriest Vladimir Vorobiev, donated books printed by St Tikhon’s to the Postgraduate and Doctoral Courses.